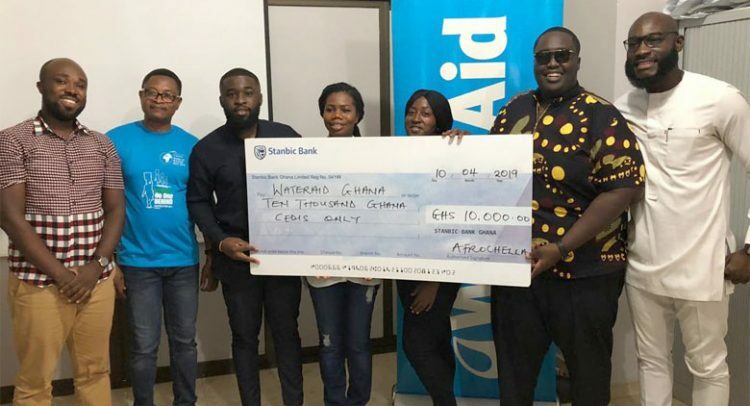 Culture Management Group‒ organiser of the annual biggest arts and music festival, Afrochella‒ has donated GH¢10, 000 to WaterAid Ghana as part of its charity obligations to support society. This is among other objectives to help deliver safe and clean water, sanitation and hygiene to deprived communities and people in Ghana. Research has shown that about eighty per cent of all diseases in Ghana are caused by unsafe water and poor sanitation. Diarrhoea is the most common cause of illness and death and the main contributor to the high infant and child mortality rates. In the three northern districts of Ghana, one in 10 children die before their fifth birthday mainly because of water, sanitation and hygiene (WASH)-related diseases. WASH-related disease costs the country significant sums in terms of health care, loss of productivity and loss of educational opportunities. WaterAid Ghana, which is a non-profit making international organisation, ensures that everyone everywhere in Ghana has access to safe water and improved sanitation and hygiene services. It, therefore, works with different organisations to reach people in the hardest and most marginalised communities across Ghana with essential water, sanitation and hygiene education. Hence organisers of Afrochella presented a cheque of GH¢10, 000 to the organisation at a short ceremony on Wednesday at WaterAid offices in Accra. Present at the ceremony were founders of Afrochella; Kenny Agyapong, Vernell Akyeampong and Edward Adjaye. “We are happy to help the people of Ghana. We wanted to do a festival that not only contributes fun but also leaves a mark behind. We are not just a day festival. We want to do something that always contributes and gives back to the people. We are investing back into Ghana. So anything to help Ghana move forward we are here to help,” Edward Adjaye said after the ceremony. According to him, it is a yearly ritual and Afrochella organisation, in the coming year, will engage in different charity works across the country. Receiving the cheque, Abdul-Nashiru Mohammed, Country Director of WaterAid Ghana, congratulated the Afrochella team for their support. “Our mission is to transform lives. So we look for unique opportunities like this when people are dedicated to support. We capitalise on it to meet our mission. One thing that stands out is that we want to reach out to everyone everywhere and it means that what is happening now is just the beginning. We need to do more,” he also added. Afrochella is currently the biggest festival that welcomes multi-generations around the world to celebrate African culture through art, fashion, food and the universal language, music. The festival is held every December 28 and the 2019 edition is expected to be more exciting.